The booklists, schedules and articles on this website are subject to applicable copyright laws and the terms of this License. The copyright holders provide these materials to the general public free of charge solely through this website. You may use them legally within certain limits. This license is intended to guarantee your freedom to privately use this free curriculum in its pure and original form without charge, to personalize this free curriculum as needed for your own family's private use*, to maintain the integrity of the copyrighted materials, and to insure that the materials remain free for all users. Altering these licensed copyrighted materials is not allowed. You may, of course, adapt the materials for your own private use with your family. You are permitted to privately distribute (but not publish or post online in any form) verbatim print copies of this licensed material, printed directly from this website, at no monetary charge. Any distributed copies of this program must include this License Agreement and all copyright notifications, for the legal protection of all concerned. You may not charge a fee for this material. It is free and should remain free. You are not authorized to distribute copies of these licensed materials on more than an individual basis, including, but not limited to, the inclusion of these materials within any form of distributed publication or generally accessible internet location, without the express written consent of the AmblesideOnline Advisory. If the curriculum is modified and distributed in violation of this license, we want its recipients to know that what they have is not the original, so as to protect the reputations of the original authors. To that end, we encourage all users to compare any received copies of this curriculum to the materials posted by the Advisory at http://www.amblesideonline.org. Anybody can and may use this curriculum by the terms of this license, but by choosing to use it, you are agreeing to never copyright it for your own use or to sell it. All copyrights of the authors of this curriculum are expressly retained and no ownership interest in such copyrights are transferred or assigned by reason of this license agreement. For the protection of each author and the curriculum as a whole, we want to make certain that everyone understands there is no warranty for this free curriculum. ~ . ~ . ~ . ~ . ~ . ~ . ~ . ~ . ~ . ~ . ~ . ~ . ~ . ~ . ~ . ~ . ~ . ~ . ~ . ~ . ~ . ~ . For a more specific statement regarding AO's copyright, click here. 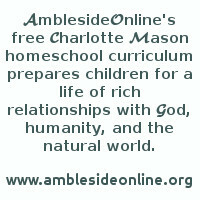 The Advisory provides the AmblesideOnline curriculum and all the helpful ancillary resources as a free service. However, although the curriculum is free, it is still copyrighted. Any republishing of the content, either on paper or electronically (such as on a blog or website), requires written Advisory permission. This material represents many long hours of Advisory toil, and we appreciate the respect you show by linking to our website rather than republishing its contents (other than short attributed quotes) elsewhere. Q: May I copy the site and link to it as my own work? A: umm. . . NO. But thank you for asking. Q: May I publish printables and schedules which use the AO years and Subject Rotations? A: We are quite happy for families to use and make sundry helpful printables for their families' personal use, and/or to share gratis with the AO community via the forum. However, we ask that the AmblesideOnline materials (pretty much anything taken from the website) not be used for personal gain or reposted elsewhere on the web. If you are in doubt about a specific project and whether or not it complies, please ask. Q: May I quote from the CM Series or from a Parent's Review article on my website or blog? A: Yes! Please do! UNLESS your motive happens to be that of boosting visits to your site by mirroring ours. Which we can't really imagine than any of you lovelies would even think of doing. However, if that were the case, we'd thank you to please refer your readers to our site for the original text. If you're in the market for hard copies of Charlotte Mason's books, we suggest that you look for reprints recently published by Living Book Press or Simply Charlotte Mason. There are other versions of the CM Series for sale at amazon that were taken from the AO website, complete with AO's formatting and added footnotes. Please do not support these opportunists as they are making money from what many volunteers worked hours to provide as a gift to the CM community. This includes Kindle versions. "Just because AO makes material available free on their website does not mean that others are free to take it and use it for their own profit." You can download the series to your Kindle for free by using "Push to Kindle" at fivefilters.org. Also, AO Auxiliary member Amy Tuttle has provided free Kindle downloads of the Original CM Series from her blog. Q: May I print copies of the CM series or PR articles? A: We'd love for you to print materials for use in personal study or in small group study settings. HOWEVER, we reserve the right to grant or withhold permission to print for reselling purposes. Q: What exactly does private distribution mean? A: Well, let's think of this in terms of a private 'bridal shower;' how many would you think might be on that kind of invitation list? Certainly not more than 10-15, right? Well, we're thinking something similar. For example, 30 or 10,000 people in a reading group, or at a homeschool conference would no longer be considered very private. This goes for both print or electronic distribution. Occasional exceptions might be made, just ask. Q: Am I allowed to make my own edited e-books or print mini-books using AO's Charlotte Mason Series online for sharing? A: Nope, that would really stress us out. We've worked hard to make our materials available for free in various formats for ease of use. Get it for your kindle, print your own copy, print a copy for your best friend, but please refer the rest of your friends directly to the website. We hope that everyone will want to grab a copy for themselves and read it voraciously! Q: I want to know EXACTLY how much I am allowed to copy and paste for quotes? A: We're pretty sure that both you and we have way more important things to do than counting words. Please just use the same discretion you would use in quoting your average print book that you'd buy in the store! Q: Charlotte Mason wrote way back in 1910's . . . aren't all of her works now in the public domain? So, why can't we freely use Charlotte Mason's work from AO's site? A: Many volunteers have contributed their precious time typing the Series from the original version and quite a number of people have contributed links and commentary to make the AO annotated versions SUPER great. Though it's true we've made it available for FREE online, as opposed to offering them for purchase only, we are still jealous over our baby. Please respect the copyright. Q: I don't understand why you won't allow people to market products and services that make it easier for moms to use AO. Why are you so stingy with something that's free? Why shouldn't I expect renumeration if I help people use AO? After all, my time is worth something. A: After purchasing and pre-reading countless books that end up not making the cut, paying hundreds of dollars in library fines for overdue books that were being previewed for the curriculum, correlating pages and pages of notes to come up with history rotations that fit across the terms, working days together on three hours of sleep finalizing each high school Year, spending multiple series of 12-hour days linking books to free online etexts to the point of back pain and thumb-muscle discomfort, this sounds ungracious, as if our time means nothing. We are pleased to offer AO as a gift to homeschooling parents, and we prefer that our users offer their help and contributions in the same spirit. We envision the AO project as a collective effort, like a church potluck. The Advisory has provided meat and vegetables, but everyone brings something to the table so there's a great big varied feast that everyone shares in, without any single person getting stuck with all the work. Recipes are shared, people swap tips, everyone enjoys the group effort. We have moms who post schedules, map links, YouTube playlists, study guides -- AO is richer because of what each mom adds to the AO "potluck." Some haven't brought a thing because the table already has plenty of food, but their friendly chatter and willingness to show newbies where the beverage table is adds to the general atmosphere. AO is here for you to enjoy, and there's enough food here that you are welcome to fill your plate, pull up a chair, and enjoy a full seven-course meal at our table. You are welcome to take a small plate and get just a couple of things because you plan to add a few meat dishes from the restaurant down the street to fill out your meal. Some just come for coffee and dessert (artist/composer study) and they are welcome, too. Those with special needs (dietary or religious restrictions) are welcome to find a table to themselves and help each other navigate the tables and figure out which dishes they can eat, and what they might need to provide themselves to fill out their meal. We don't even mind if someone brings beautiful plastic forks and knives with a sign that says, "These utensils are crafted by me and free for you to use at this feast; if you'd like these in stainless or plated silver, my shop is at 456 Main Street," because their free offering adds to the table and doesn't require that anyone make a purchase to enjoy their meal. But when one person starts collecting recipe cards from the potluck table and compiles them to sell, or when one person brings his bowl of beans and says, "here's my contribution, but you have to pay for it; I'm not giving it away," or starts hoarding some of the platters, or wants a fee for acting as tour guide -- others follow suit. The whole atmosphere changes, and what was a beautiful, open, giving community becomes something ugly and competitive, with each person protecting his own interests, and trying to find a way to turn the project into profit. AO is a labor of love and we welcome you to use as much or as little as you need, but we feel that it is fair and proper to expect respect for our vision and help in contributing to the community rather than stifling it through self-interests. With that in mind, please do not ask if you may set up a table with brochures advertising your product. We will not allow you to interrupt conversation at our tables to sell your product or services. You may not prepare "to go" containers of our food to sell as a convenience. You may not distribute flyers on the windshields of the cars in the parking lot. *Private schools and umbrella schools seeking authorization to use or modify these materials will be considered on a case-by-case basis by the Advisory.